Human Feet Washing Up On Canada's Shore: Where Do They Come From? It sounds like the plot of a sinister mystery. A man is walking his dog along the picturesque shores of British Columbia when the dog darts ahead toward a pile of kelp. Buried within it are the remains of a human foot and lower leg, still encased in a white ankle sock and black running shoe. This is what happened to Mike Johns, a 56-year old resident of Jordan River, about 70 miles southwest of Vancouver, Canada. 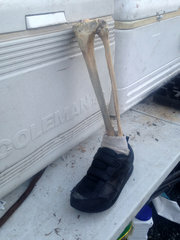 “By the looks of it, the foot was totally intact. The ankle bone still worked and the bones were attached at the base of the knee,” said Johns. Johns, worried the foot would be washed back to the ocean or be eaten by a nearby bear, brought it back to his house and called the police.